Today, we present you the Beta Version of eKameno Little!!! This version is a private beta version, that is why we will offer it to a small group of users. This small group of users will test the beta version with the purpose of improve it and make it stable, then we will open the system to everyone. So we are looking for developers and users in this first phase. In one hand, we need developers in order to test the plugin system. In the other hand, we need users in order to the test the application usability. If you are developer or if you just want try eKameno Little in your home register on our NewsLetter and we will send you a private message with the instructions to download Little. 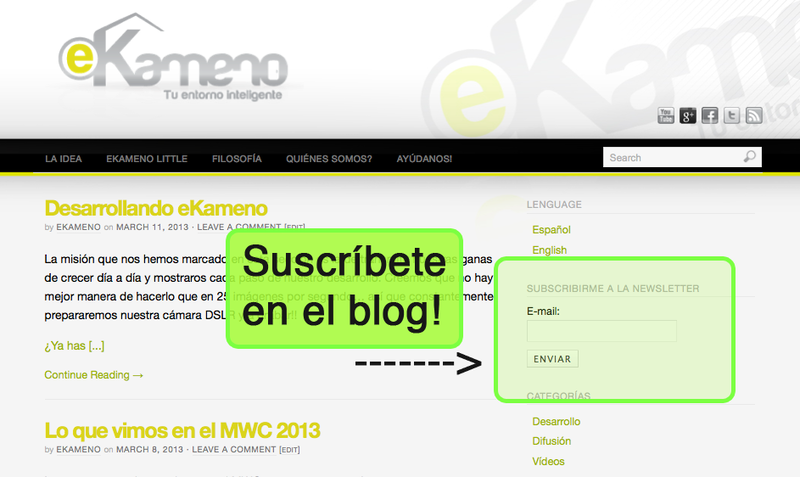 You should introduce your email in the NewsLetter section in the main page of our blog. as you can see in the picture below. Only the emails registered in the NewsLetter will work in the Beta. You should confirm the registration email. If you don’t receive the registration email, it might be found in the spam box. In that case you should open the spam box and click the option this is not spam inside the email, then you can confirm the register as you can see in the picture below. When you have done both steps you will see the following confirmation message.